I LOVE LOVE LOVE my Gudde Co coffe table, bar top, and soon to be kitchen table. He's the guy to go to for custom woodwork or furniture of ANY kind. I thought I was a perfectionist and stickler for details, but Dane exceeds my quality standards every time! I hired Dane to build a custom bed inspired by a design I had noticed. He took my vision and executed perfectly. I was impressed by the thoughtfulness of hardware, assembly, and quality of wood working. Keep in mind that this was his first bed project - I've had a few designers take a look and the consensus is that the work is solid. He subbed out some metal fabrication as well for the spine of the frame, which was a bonus and perfect quality as well. Suffice it to say, I look forward to working with him again and can recommend him with confidence. Working with Dane Gudde was a pleasure. He delivered everything as promised and I am extremely happy with the quality and design of his work. I look forward to doing business with him again. Dane is a true artisan who takes great (and well deserved) pride in his work. 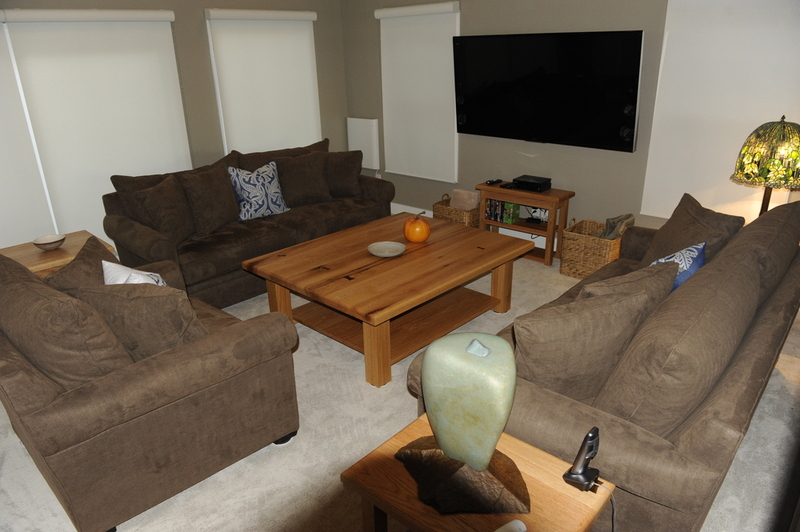 While looking for a live edge mantle, I stumbled across one of Dane's beautiful live edge cherry coffee tables. I contacted Dane and asked about making a custom mantle. Dane came to our house and instantly had a vision for the piece. Dane is great about asking exactly what the customer wants and tries to accommodate. 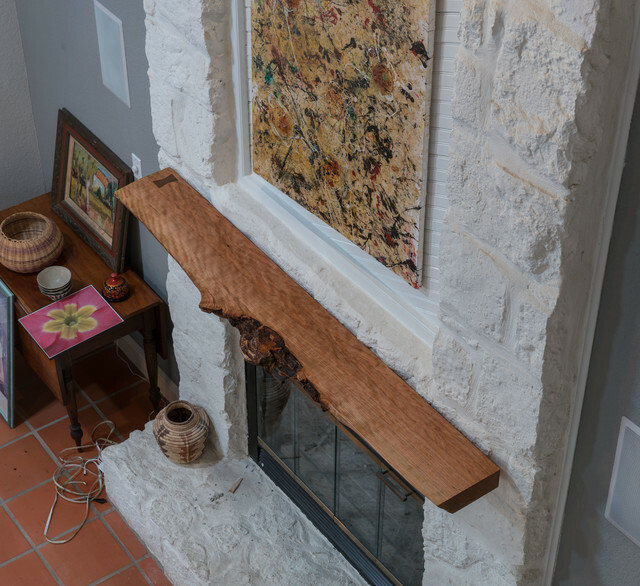 Dane let me see the exact live edge board and had great ideas about how to attach to the fireplace wall. During the project, I decided to have Dane make a pedestal vanity again out of a live edge board. As you can see, it turned out absolutely stunning. Dane came to the house to install the mantle and deliver the vanity. We will definitely both recommend his work to others and as projects come up, use Dane as his creativity and workmanship are fantastic. Plus, it is a pleasure to work with Dane. My husband and I had the pleasure of having Dane build us a dining table. The whole experience was great from start to finish. Dane is a real artisan. He is very passionate about his work. In addition we appreciated that he was very professional, really good at keeping in touch and listening to what we wanted. He was also very kind and patient with us when we had trouble visualizing the finished product. He built the table from Brazilian imbuia wood and we love the character and variation in the wood. We were also impressed with the no-voc finish. We would definitely recommend him to anyone looking for a one-of-a-kind beautiful piece of furniture.